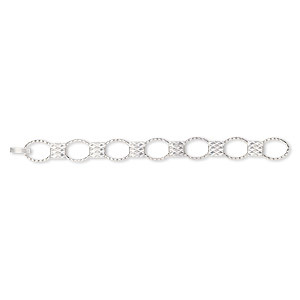 Bracelet component, silver-plated steel, (12) 9.5mm round link settings, 7 inches with fold-over clasp. Sold per pkg of 2. Item Number: H20-4732FD Have a question about this item? Make easy and quick bracelets by bonding on your favorite flat components: cabochons, crystals, beads, shells or buttons. 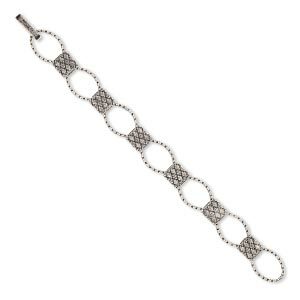 Bracelets are 7-inches long, complete with clasp, and can be easily modified for smaller wrists, featuring a center mounting hole for secure bonding or easy beading. 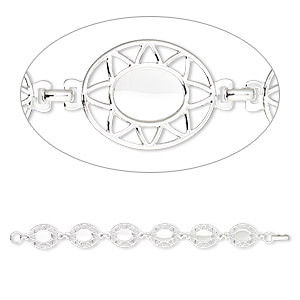 Bracelets are a base metal of steel with silver plating. 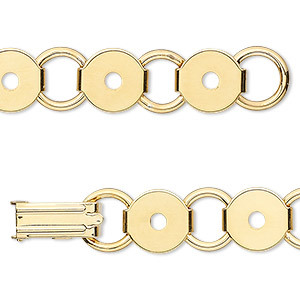 Bracelet component, gold-plated steel, (12) 9.5mm round link settings, 7 inches with fold-over clasp. Sold per pkg of 2. Bracelet component, silver-plated steel, (10) 13x10mm oval link settings, 7 inches with fold-over clasp. Sold per pkg of 2. 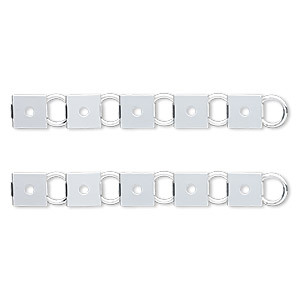 Bracelet component, silver-plated steel, (12) 10mm square link settings, 7 inches with fold-over clasp. Sold per pkg of 2. 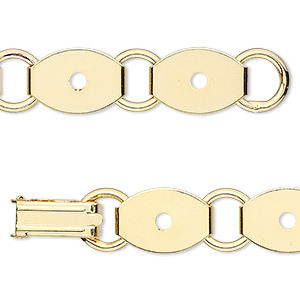 Bracelet component, gold-plated steel, (10) 13x10mm oval link settings, 7 inches with fold-over clasp. Sold per pkg of 2. 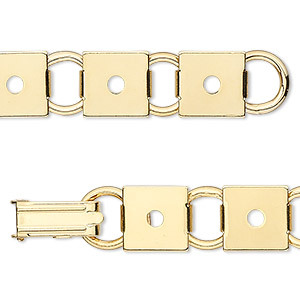 Bracelet component, gold-plated steel, (12) 10mm square link settings, 7 inches with fold-over clasp. Sold per pkg of 2. 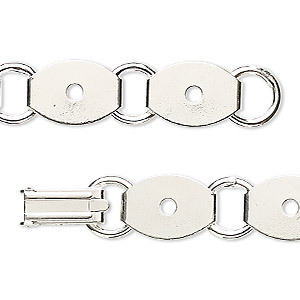 Bracelet component, antique silver-plated brass and "pewter" (zinc-based alloy), 20x14.5mm oval with (7) 11x10mm rectangle settings, 7 inches with fold-over clasp. Sold individually. 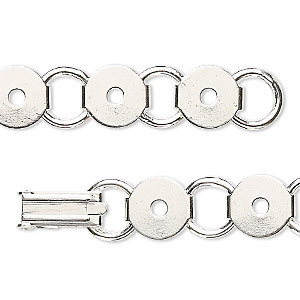 Bracelet component, antique silver-finished brass and "pewter" (zinc-based alloy), (7) 20x14.5mm oval links with 11x10mm textured rectangle glue-in setting, 7 inches with fold-over clasp. Sold individually. Bracelet component, silver-finished brass and "pewter" (zinc-based alloy), (7) 20x14.5mm oval links with 11x10mm textured rectangle glue-in setting, 7 inches with fold-over clasp. Sold individually.